The crew loves setting sails. Travel light - is our best advice to you, swimsuits and T-shirts is all you need on board during daytime. In the evenings people dress casually, but bring sweaters and long trousers if you are coming in the cooler months. It's a good idea to bring a pair of soft shoes or sandals just to use on the boat. On board we provide hand towels only so please bring your own bath and beach towels. All this should be packed into a soft bag, not a suitcase, which can be folded and stowed away to give more room in your cabin. The gullet M/S MIRIEM SOPHIE was built in 2002 and totally refurbished in 2005. This wooden yacht was designed as Ayna-Ketch (mirror-aft) and build by ship builders using traditional methods. 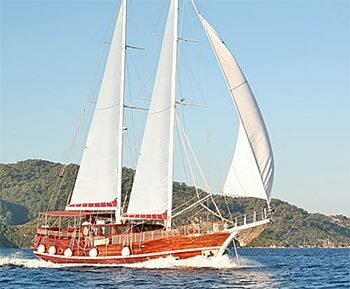 This beautiful and classical boat belong to the luxury category of Turkish gullets. Their outstanding features are a very solid construction for a maximum cruising and sailing performance, the utilization of the finest materials, the most sophisticated equipment in accordance with today’s safety standards, a very tasteful interior design and a stylish ambiance: A dream vacation of pure luxury. She has 6 cabins with wide, comfortable double beds. Two of them are spacious master cabins, the other 4 cabins are with double beds. Your bath here is large and comfortable a closed shower cabin, and the toilets are with flush system, just like the comfort you are used to. All cabins have air conditioning which can be run for several hours daily during naps or when preparing to sleep for the night. Your Itinerary: You may start your journey either in Fethiye, Gocek, Marmaris or even Antalya, we can plan and arrange it with you, depending where you wish to go (map here) or according to your chosen airport, Dalaman or Antalya. The Captain knows each harbour and every cove. 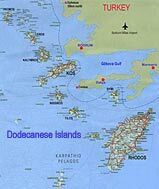 The cruise will follow a fixed route which will be discussed with the new guests on board or before in mail exchange. The coast of Turkey, with its deep inlets, wide gulfs and sheltered bays, and the nearby Greek islands, is a unique holiday region. The pleasant climate, crystal-clear water and the delightful, ever-changing scenery of the Eastern Mediterranean are waiting to welcome you. You can snorkel to your heart's content, windsurfing or kayaking! The M/S M/S MIRIEM SOPHIE even carries a Jokerboat with a 50 HP Outborder, so you may try Waterski or Ringo-rides, (there is an extra charge of about 10 Euro/10 minutes). In the months which are not so warm, walks to ancient places or to nearby typical villages are the favourite pasttime. The Turkish cuisine is considered to be among the finest in the world, for sure she is one of the healthiest. On board the M/S M/S MIRIEM SOPHIE you will find the finest Turkish dishes, prepared using the freshest vegetables, fish and meats. Our cook is an expert in his field. He will pamper you with three meals a day: breakfast, lunch and a dinner. If you have any special dietary requirements (if there are certain foods you dislike or mustn't eat), simply let him know. He will be able to prepare dishes to suit your exact taste. You may choose between Full board (3 meals + tea time) price € 28,- p/person. Soft Drinks and alcoholic drinks are extra, we can buy them at supermarket prices and you just pay us the bill plus a service-extra for the crew of only 10%: We think that's a fair offer and all previous guests did appreciate that very much. There is nearly none of the gullet charter-companies who tells you the truth about the use of air-condition on Gullets. Yes, yes M/S M/S MIRIEM SOPHIE has AC and you think you can switch it on when you ike. It's not! On a boat the AC can only run when the generator is on, or in a harbor when connected to 220 Volt. But mainly you are in anchor bays, often next to a neighbor who doesn't like the noise of your generator and you wouldn't like it either from your neighbour during the night for example. Life Raft, Life Jackets, Fire Extinguishers, Fully equipped Galley, Refrigerator, Deep Freezer, Ice Boxes, Ice Maker. Spacious sun deck area with Sun mattresses and cushions, Sun awning, Cushioned aft deck with a large table, Deck chairs, spacious saloon with bar and dining table, Music Set, Color TV, DVD / VCD Player, Joker boat Dinghy with Yamaha 40 HP outboard engine for waterski or Ringo rides, for your fun we have a windsurf and canoe for 2 persons, fishing and snorkeling gear. And of course, like all our boats, also the M/S M/S MIRIEM SOPHIE meets international safety regulations including life jackets, fire extinguishers and alarms.